Here in Cebu, restaurants offering different buffet dining styles with various cuisines are popping up like mushrooms. And for foodies like me, the first thing to consider before trying out these restaurants is to check what's different — what sets it apart from the other buffet restaurants out there. When I got invited to another Zomato Foodie Meet-Up at Chik Chow Food Express, I immediately Googled it because one, it was my first time to hear about it; two, I didn't know where exactly it's located; and three, I wanted to read reviews about it so I can set expectations. Having read good reviews about Chik Chow, all I did was prepare myself for a heavy lunch appointment and my verdict will follow. The word Chik was derived from the owners' son, "Buchik" and Chow meaning "to eat". Upon arriving at the restaurant, my first impression was it did not look like a restaurant. Because in fact, it was an ancestral home transformed into what Chik Chow is now. Ambiance-wise, I loved the way you feel at home somehow when you dine at Chik Chow and the food served are what your mom or grandmom cooked for everyone in the family. Space-wise, Chik Chow can accommodate around 100 people and there's ample parking space for customers. They also accept short orders and food catering for events. This is the humble buffet spread of Chik Chow Food Express. Currently, they only offer around 14 dishes, 2 rice variants, 2 desserts, and 2 options of bottomless drinks (Iced Tea or Lemonade). The dishes served are usually the owners' favorites such as Lengua Estofado, Chinese Lumpia, and all-meat Dinuguan. The best asset that sets Chik Chow Food Express apart from the other buffet restaurants is that their food makes you feel like you're eating your parents or grandparents' specialties. 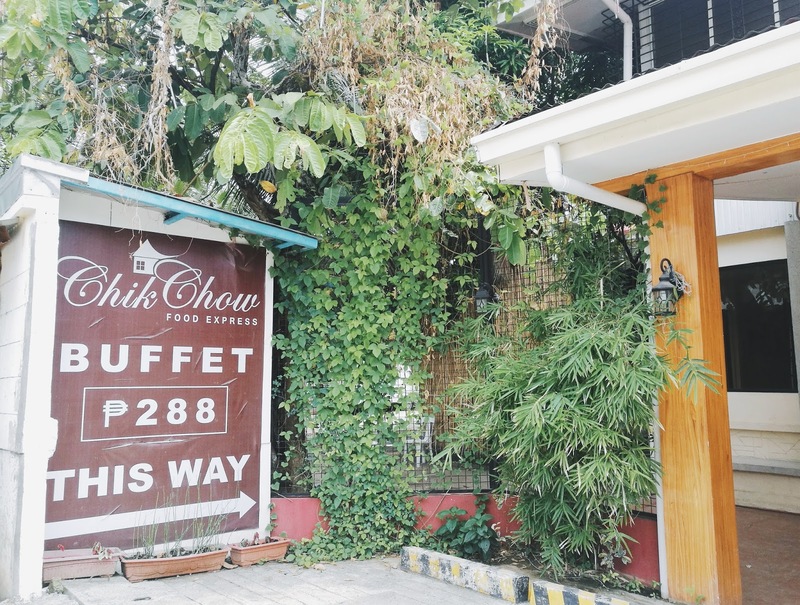 Filipino dishes incorporated with Chinese touch are Chik Chow's forte, so to those who want to try comfort food dining (especially those with Chinese lineage), Chik Chow Food Express is the place to be. As I have mentioned earlier, Chik Chow has two options for rice eaters like me. They have the good old plain rice and their very own Chik Chow rice. I opted for the Chik Chow rice (because of course, plain rice is nothing new to me. Haha!) and I loved it. I don't know what the ingredients are but it's really delicious. It can be a viand in itself as well. They always say never judge food by how it looks like. This Roast Pork dish may not look much appetizing to you but I tell you, never skip this. This Roast Pork dish is really delicious and the meat is very tender. It's a must-try! I have to tell you that I may love eating, but there are still some things that I'm ignorant about in the foodie world. While I was getting myself some food, I only read the label and the food instantly goes into my plate. I ate the Lengua Estofado, I told the owner that it was one of my Top 3 favorites because I love how it melts in my mouth and it was just so flavorful. And now, while I'm writing this post, I Googled what this dish is made of, and I was honestly astounded that Lengua Estofado translates to eating ox tongue!!! I don't know what to feel honestly. I'm literally laughing at myself right now!!! But nevertheless, this ox tongue dish is definitely a must-try when you dine at Chik Chow Food Express. This Grilled Tuna Panga was in my Top 3 favorites because it's not like the other that I have already tried before. The tuna was very savoury because it was bathed with different kinds of herbs and spices. I also love that it didn't have the reeking "fishy" smell and taste. The last dish included in my Top 3 favorites is Chik Chow's very own, Meatballs ala King. I have to say that I'm not a fan of meatballs with sauces but just looking at it, I knew I had to try it. The ala king got me curious, you know. What made me love the meatballs is that the meat itself was already flavorful and tender and it was just perfectly complemented with the ala king sauce which honestly tasted like a creamy carbonara sauce. Yuuuuuum! One thing you'll notice about the buffet spread at Chik Chow Food Express is that they serve dishes that you don't commonly see in other buffet restaurants. Such as this Fried Dilis. I was surprised and amazed that they had this dish and I tell you, this shouldn't be skipped as well. I don't know if you have tried it before but their Fried Dilis was something new to me because it was sweet. When we asked the owner, Mrs. Viola said it was her specialty and it was just a simple recipe. The dilis were deep fried, drained, and then sprinkled with white sugar, onions, spring onions, garlic, and green tomatoes. It was my first time to try a Chinese Lumpia so I did not know what to expect of this dish. I simply asked one of their staff to make one for me. I don't know how many ingredients comprised this lumpia but I know that there are ground peanuts. Haha. It was the only ingredient that I was able to appreciate separately and the rest was just a mixture of ingredients to me. It wasn't that delightful to me maybe because I prefer the lumpia with a sauce. To sum it all up, I have to say that my dining experience at Chik Chow Food Express was great. With their delicious food and homey ambiance, the price of PHP 288 per person is already very worth it. And so much affordable compared to the others too. For now, they serve the same set of dishes for lunch and dinner but they are already looking at adding and/or changing a few dishes for a twist. But that shouldn't stop you from trying Chik Chow Food Express because really this restaurant is a must- visit.